I’ve been thinking a lot about divine connections – about meetings orchestrated by the Spirit of God. You know …. where one or the other person was in the right place at the right time to meet the right person? I’ve been thinking about the divine connections the Lord has orchestrated in my own life. Friends of mine who I have not yet seen in the flesh, but who have, over time, proven loyalty, dedication and have become family. There have been people I have met online through the blogosphere who have stood by me through my recent marital struggles and have been there to encourage and pray and support. Some of those people I have met I would willingly do anything for because their level of support for me has gone beyond the call of duty. I have even met a couple people who loved me enough to let our communication end for our mutual benefit – to those people (you know who you are, if you ever read this) I owe a huge set of gratitude and love, because they took quite practically the Scripture injunction to cut off the hand that causes you to sin. Their willingness to put to death something that started well for the sake of their knowledge of where God was taking me still humbles me. Now God is allowing more divine connections. I’m excited to see where he is going. Through the internet, God is linking his entire body in such a way that people all over the world can band together and pray for issues in a short space of time. I am enthralled to see how God has joined my heart to South Africa, Minnesota, Ohio, Texas and Canada, among others… all these people who have prayed and are praying for me, and to whom I owe my life. God has even done some binding of hearts to others here at home in Barbados – people who definitely were meant to be in my life for the long haul. I’m just ready to see where God goes with this! I pray for everyone reading this… I pray that divine encounters be released to you, and that God connects you to others according to his divine plan! Bajan Tidbit – The national dish of Barbados is cou-cou and flying fish. Cou cou looks something like mashed potatoes, but is made traditionally from corn meal, and may contain okra slush. Most Bajans like their flying fish breaded (covered in bread crumbs) and fried. Go here for some more details! I just want to give God a HIGH note of PRAISE for his WONDERFUL, POWERFUL intervention! I can’t stop praising the Lord for how he has done in about three / four days what I thought was going to take the whole year to do… God is restoring my marriage completely! Jennifer: yes….true….well there u go….u won’t even need to lift a finger….THE FINGER OF THE LORD IS POINTING AT YOU and He will work this out!!!!! And he has been true to his word! My wife Lesanne went to a leader’s retreat at church over the past couple days and on Saturday came home and lined the whole family up and prophesied to us each in turn… Through her, God told me that I had to pass through the way that I did because he was preparing me for the new season in my life. She prophesied over the entire family as a unit as well – and it was a powerful experience! She was severely impacted by the presence of the Lord while praying and laying hands on us – especially our younger son Jonathan. God worked on her over the retreat so that we have become one again! There was a lot of confession, and asking for and receiving forgiveness on both our parts, and all the past has been washed away in the power of the spirit of reconciliation! And, just like Jen prophesied – without me lifting a finger. Isn’t God AWESOME? Since that time, we have really been re-linking and really connecting on a deeper level. We woke up on Sunday and worshiped together, singing songs of praise and worship together on our bed – something we hadn’t done in a LONG time. I remember when she said, “I love you,” and I could actually see the love shining from her eyes again – that sight nearly broke me. After the singing, I, following the prompting of the Spirit, told her that I would put our wedding tape (still VCR, haven’t had it copied to DVD, yet – I know, lazy, right?) in so that we could have it playing in the background while we got ready for church. Guess what it started on (it wasn’t set at the beginning)? The first things we hear are the prophetic words spoken over our marriage by the leaders of my house church at that time – an observation that the colours chosen for the wedding were white and gold, and how gold represented the glory of the Lord, and prayer – and that how Lesanne was being called into a ministry of prayer which included me, her husband. The prophetic symbol for her was a piece of gold coloured cloth that was draped around her shoulders; when the word included me as well the cloth was extended and placed around both our shoulders together. The prophetic word over me was an encouragement to continue in the prophetic call I had been released in – the call to show the church its dimensions and what it is to look like. Prophetically, I was given a gold coloured straight stick, representing a measuring rod. Ezekiel chapters 40 -42 detail the account of the prophet seeing an angel measuring out the exact dimensions of the Temple area with a measuring rod. In fact, there was a time that the Lord literally forced me (naturally I was bored out of my skull at the time, but I was compelled!) to read that entire account – and I knew afterwards that this was my call. That’s what was shown immediately after our prayer time. Is God saying something to us? I think so! He is re-establishing our call together as a couple, and speaking the words over us that he did on our wedding day! We have a lot to thank God for! That’s a major understatement…. I am in awe at the majesty of our God! Join me in praise and worship and thanksgiving as the Lord has restored us! I pray that he puts in place what is necessary to continue to knit us together, and I pray that you will continue to pray for us as we seek God’s face together – a pride of lions roaring to our King! 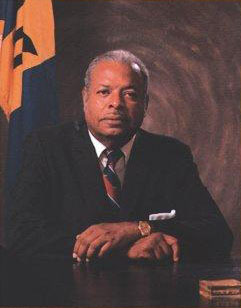 Today is January 21st, Errol Barrow Day in Barbados, where I live. Just like the American’s have Martin Luther King Day, Barbadians celebrate the birthday of the man who led Barbados to Independence from Britain on a rainy night on the Garrison Savannah on November 30th, 1966. 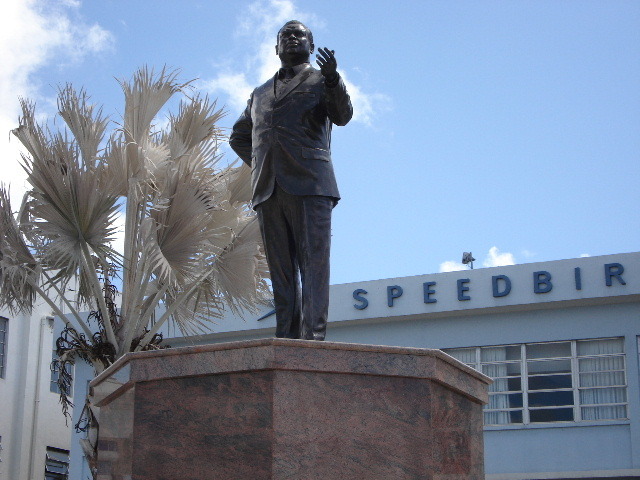 Here is a picture of the life sized statue of the Right Excellent Errol Walton Barrow – one of the ten National Heroes of Barbados. Here’s some more details about him – and you can search the underlying site to find out more about Barbados, too. Ok! Off to my holiday for the day! Bajan Tidbit – Because we were colonized only by the British, we drive on the left side of the road, rather than the right, like the majority of the road. It’s always hard when I have to drive in the US… haha! This post should really have come before the last Personal Devotions post, but busyness made it sleep in my drafts folder for weeks. If I don’t work on it now, it’ll stay here another two weeks – and it’s important as both it and the last post link into who I am now. So, read on! Long and short of it, I was challenged that boredom and busyness have been eating away at my marriage and that I have cocooned myself into a life that is unexciting and humdrum. I felt like I had a storm of emotions inside that boiled down to me never really allowing myself to enjoy my youth and all my life I’ve existed behind my ‘avatar’. Yes, it came after watching the movie Avatar, but being a computer geek, the name sparked a deep revelation for me. For the uninitiated, an avatar is defined as an ’embodiment’ – and its usual meaning on the blogosphere is the picture or animation that represents a poster or commenter. Some people are only known by their avatars – as you will probably never see them all in real life. I woke up with the the insatiable need to ROAR! When I shared it with my wife (shyly, as I was embarrassed – another weird emotion for me) she encouraged me and we roared together! Since then lions have been on my mind. This last weekend, God arrested me while showing my boys an old videotape of The Lion King – where Simba loses his father through false accusation and has to face his past and return to Pride Rock to save his family from destruction. What really gets me is when Simba ROARS – which gets the whole pride roaring alongside him. God used that image to call me to remind me of how he sees me. As Simba had to overcome his past, so has he called me to do – to “remember who [I am]” and to ROAR over my circumstances. This is the goal of the Band of Brothers’ ministry – to cast a vision to our tired and warn out generation of men and to challenge them to engage in the noble purpose for which we were created. We want to motivate and inspire men by echoing the call of Christ to be willing to give up everything for Him – no matter the cost. For we do not want to miss out on a noble mission and legacy that will echo throughout eternity! I have taken that rallying call – WHATEVER THE COST! – and that is my motto for this season of my life. The cost of discipleship has already been painful – but I WILL NOT STOP NOW. Pray for me that God will allow the lion to roar out of me – empowered by THE lion – the Lion of the Tribe of Judah – the LORD JESUS CHRIST! Pray that WHATEVER THE COST I will continue along to full manhood – full maturity … creation groans in anticipation of the revealing of the [mature] sons of God! Sobering words. Anyone who loves father or mother…. son or daughter… more than God is not worthy of him. How easy is it to love other things more than God? To what do I owe my allegiance? Anyone who does not take cross and follow Christ is not worthy of him. What does that mean? How do I take up my cross? Do I want to take up my cross to follow him? I have decided to follow Jesus. Behind my failures and successes, behind every time I mess up, behind any time I share a wonderful powerful testimony of God’s glory – there lies a heart that is sold out for God. But yet – being sold out for God still means little if I don’t choose to be a disciple. NO MATTER THE COST. On Sunday I am sure I heard in my heart – I think I was coming out of a dream – the term ‘Band of Brothers.” I had no reference point for the term, so I just left it alone, let it simmer in its own juices, as it were. This covenant has resonated with me. I WILL SURRENDER MY ALL to GOD – NO MATTER THE COST. Personal Devotions – Subduing the Lion! The action words there are important – Resist and Subdue. Speaks to violently overcoming the sin, like taking a wild animal like a lion and subduing it, being made its master. And look – there is a promise of restoration once you have suffered a little while! Personal Devotions: Prophetic Encouragement for the New Year! Just wanted to wish all of my blog family a HAPPY NEW YEAR. If anyone had a New Year’s resolution to read through the Bible in this year – here’s a resource that can help: the Daily Audio Bible. Brian (the leader of this community) reads through a different version of the Bible each week starting at Genesis and goes straight to Revelation. It is a community with forums, chat rooms, a Facebook page; you can read along with a link to the equivalent Scripture on the Net… check it out! It has really helped me, even although I haven’t been consistent last year. I want to change that this year! 26At that time his voice shook the earth, but now he has promised, “Once more I will shake not only the earth but also the heavens.”[a]27The words “once more” indicate the removing of what can be shaken—that is, created things—so that what cannot be shaken may remain. So my prayer for this year is that what God has been shaking in our lives will shake off the things that can be shaken – sin, everything evil, the flesh – so that the unshakable – the KINGDOM OF GOD – will remain! Check out the Daily Audio Bible, and be impacted with the Scripture in a whole new way: go here and click on the Listen Now link.